Extended Vacation: Home Never Looked So Good is a comedy about an antagonistic Granny, who convinces her frugal Midwestern son-in-law and family to take her on a driving vacation to Mexico. Once there, the family van gets stolen with everything in it, including Granny. Now, the border patrol won’t let them cross the border, until they can account for the missing van and Granny. Will Granny show up before the money runs out? All the hotels are booked solid with a toilet paper convention. Where will they stay? Let the comedy begin! 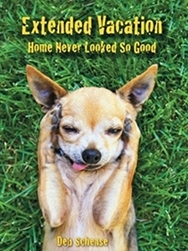 If you love a good comedic vacation, Extended Vacation: Home Never Looked So Good is for you!